By the fourth quarter of 2018, the estimated economically active population was about 8.5 million. Of which 64.6 percent were males and 35.4 per-cents were females. The economically inactive population was about 7.7 million. 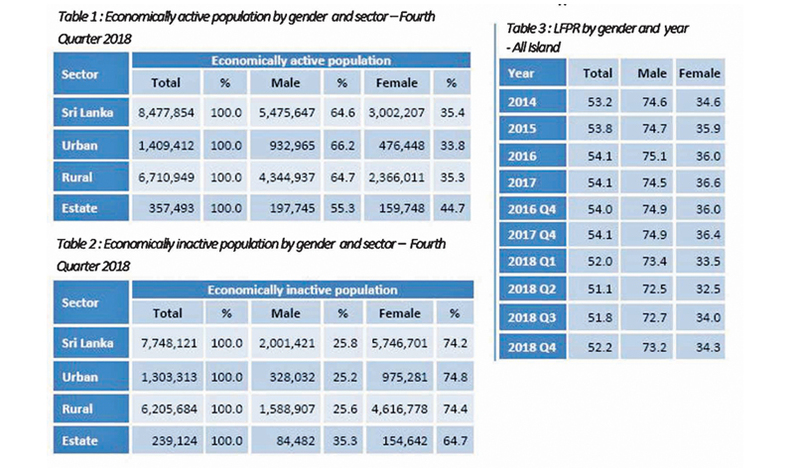 Out of the economically inactive population 25.8 percent were males and 74.2 percent were females, the quarterly report of Sri Lanka Labour Force Survey published by the Department of Census and Statistics stated. The report also shows that male participation to the labour force is always higher than that of female. The distribution of Labour Force Participation Rate by age group and by gender depicts high male participation compared to female in all age groups. The highest participation rate for male is reported from age group 45—49 years (96.7%), while that for female is reported from 40-45 age group (51.2%). During fourth quarter of 2018, the total number of employed persons in Sri Lanka is estimated at about 8.1 million. Of which, about 46.7 percent engaged in Service sector, 27.7 percent in Industries sector and 25.6 percent in Agriculture sector. Compared to 4th quarter 2017 in 4th quarter 2018 a decline in employment numbers can be observed in Agriculture and Industry sectors while the Service sector employment shows an inverse. According to the percentage distribution of male and female employed population by main industry sectors, the highest employment share is in service sector and this is true for both male and female, while the lowest shares are for agriculture sector. Among employed females 29.1 percent is in agriculture sector while this share is 23.8 percent for males. The number of unemployed persons is estimated as 346,998 during the third quarter 2018. The unemployment rate for the third quarter 2018 is 4.1 percent. Overall unemployment rate reported for female is 7.1 percent and it is 3.2 percent for male. Youth unemployment rate (age 15- 24 years) corresponding to the fourth quarter 2018 is 21.9 percent and that is the highest reported unemployment rate among all age groups. Further the unemployment rates for males and females are 18.1 and 28.7 percent respectively for age group 15-24. The survey results further reveals that the unemployment among females is higher than that of males, in all age groups. Youth and female unemployment contribute more to the overall unemployment of the country. The highest unemployment rate is reported from the G.C.E(A/L) and above group which is about 8.7 percent. Corresponding percentages are 5.5 percent and 11.9 percent for males and females respectively. Female unemployment rates are higher than those of males in all levels of education. Survey results further show that the problem of unemployment is more acute in the case of educated females than educated males, which was observed consistently over the results of previous survey rounds as well.